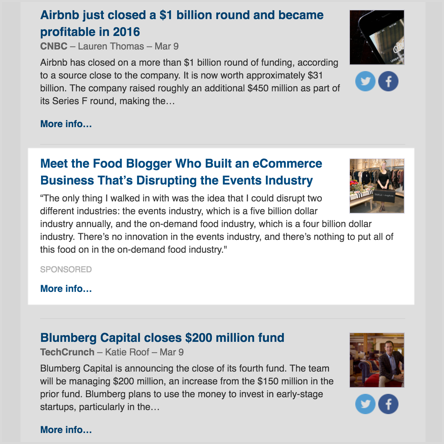 For the first time, news aggregator Nuzzel will include advertising. That doesn’t mean you’re going to see banner ads popping up all over the startup’s app and website. Instead, the Nuzzel Newswire consists of sponsored links in Nuzzel’s email newsletter, pointing to a blog post, press release or news article of the advertiser’s choosing. So why call it a “newswire” when it’s really just sponsored content? Nuzzel founder and CEO Jonathan Abrams told me he’s pitching this as an alternative to paying for press release distribution through a service like PR Newswire, where he said “probably few people will really read” it. In contrast, he said the Newswire will only run one sponsored story per day. Nuzzel, for those of you who haven’t tried it, offers a number of ways to keep track of the news, whether that’s following feeds/newsletters curated by Nuzzel or other users, or by connecting your Twitter account to see the stories that are getting the most shares from the people you follow. Abrams declined to reveal anything about the size of Nuzzel’s audience, except that “it’s fair to say that at this point, the real value of the Nuzzel Newswire is the quality of the audience vs. huge size” — a point underlined on the Newswire website, which highlights a few individual Nuzzel users.